There is much discussion these days on Constitution making. All and sundry have become experts in Constitution making and experts in interpreting every single word of the proposed draft Constitution presented to the Parliament. It has to be debated and agreed upon and finally presented to the people’s approval. However, the place given to Buddhism in it has taken an important place in this public debate among many other issues with views expressed for and against them. It was in this scenario that MP Dinesh Gunawardena met Ven. Malwathu Mahanayake Thera to appraise the prelate on the harmful effects of the Constitution in the making, on Buddhism and to the country in general. His visit was to obtain the prelate’s advice and blessings to their campaign against it. Alas, the advice given by the prelate was not what he expected and not to the liking of the opponents of the Constitution. This incident led to some monks and laymen criticising Malwathu Mahanayake Thera, expressing views against the advice given by the prelate which was never anticipated by them. The language and the tone used by them in some instances were most disrespectful to the Ven Mahanayake Thera and in general to Buddhism. The opposition groups of MPs, the monks, various individuals and representatives of political and civil society organisations opposing the new constitution on various grounds had met the Malwathu Mahanayake Thera on many earlier occasions for the same reason that MP Dinesh Gunawardena met the prelate on his recent visit. They were full of praise for the Ven Mahanayake Thera for listening to their views on the Constitution, appreciating their concerns and blessing them, not expressing any views they disliked or in conflict with views they held. On this particular occasion the situation changed when the Mahanayake Thera’s advice was not to their liking and not what they anticipated. This changed everything and a campaign critical of the Ven Mahanayake Thera was initiated accusing the prelate of ignorance of facts being misguided by others, submitting to pressure, etc. etc. This is a not a healthy situation in a liberal democratic society. Politicians of all shades and colours need to tolerate dissent and be able to respect other views and their right to hold views personal to them. It’s not political. This is not a totalitarian society for such a situation to prevail. In a totalitarian society everything is political. Your life is not yours, and neither your conscience. Everything you say or do is an act of “support for the regime”, or an act of “defiance against it.” There is no middle ground, no private life, and no space for people not to get involved, to remain silent and to be left alone. In the totalitarian society you are either “with the powers” that be, or you are “against them.” Every act involves that choice, and there are no other choices because in a totalitarian society everything is political and nothing is private and personal. We experienced this situation during the days of the LTTE war. At that time anyone expressing a view against or not to the liking of the powers that be, was an LTTE supporter or an agent of anti-government forces. You were either “with the regime” or “with them, the LTTE”. There was no middle ground. Space should not be left, for such a situation to develop in our society once again. Sri Lankan society is a liberal democratic society. But if its opponents most thoughtfully are bit by bit taking our society to a place where the space for privacy and agnosticism recede, and where more and more previously personal matters are being interpreted, by both sides as political choice – making you with “us” or with “them,” that way lies the end of liberal society. The Mahanayaka Thera expressing his belief in what was said by the President and the Prime Minister of the country should not be taken as an endorsement of, or an indication of support for their policies. There has to be room in liberal society to not be forced to choose sides. There also has to be an ability to oppose the party in power while recognizing its legitimacy. At the same time no party in power or in the opposition should take it to a strange, contrived position hoping to goad people into protesting against the other, or make them look weak if they don’t. That if anyone agrees with an issue and does not oppose it, then he is with the government. Many of the opposing enthusiastic critics rising to the bait have reacted by embracing the opposite position that if anyone is not siding with them they are siding with the government. There was nothing offensive in the prelate advising MP Dinesh Gunawardena to use this rare opportunity presented by the Tamil parties extending their cooperation to the task of Constitution making, and to do what is best for the country. The prelate advising him to, not simply embrace the opposite of whatever the government wants to do is fair and timely. One’s choices are not limited to that of you are “with us or against us.” One’s choice is one’s opinion. It’s not politics. The monarchs of the Kandyan Kingdom made sure that the rich resources of this verdant rain forest area were maintained with strict discipline. Punishments included death for those who flouted the rules, even to pluck fire wood in the “thahanchikelé” or strict forest reserves. The indigenous flora and fauna were sacrosanct. Large structures, agriculture, irrigation, hunting and animal husbandry and any other commercial venture took the environment into consideration first and foremost. It was considered a privilege to be blessed with such abundance of natural resources in and around their capital city, producing clean air and fresh water, ensuring a thriving agricultural economy. By about the late 1960s however, “democracy and progress” required votes, quick fixes and all kinds of arbitrary “development” ensuring the hillsides of Kandy were eroded and congestion gradually engulfed the entire city. There was little consideration to infrastructure, waste disposal, sanitation, emergencies, evacuation, safety, archaeological sites, cultural heritage and certainly not the environment. Many sustainable development plans came and went since 1976. As the powers that be and their voters did not benefit, the plans gathered dust in a drawer. 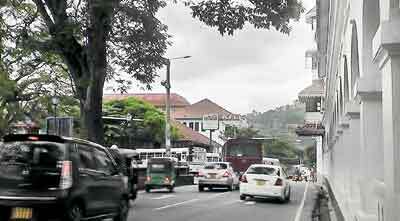 Four decades later, Kandy has the highest air pollution rate in the country and an increasing rate of respiratory related illnesses is recorded. Schools are bursting at the seams with students and the majority travel very long distances in to Kandy daily. The General Hospital too, caters to patients from other regions and overflows with the ill. A chrome and glass Super Mall in the centre of the city was allowed to be built regardless of the fact that it blocks the wind tunnel which kept the city cool. It also blocks the bird flight path, ensuring the disappearance of many species from the area. The paddy fields / marshy areas, water ways and the banks of the Mahaweli are overrun, built over and encroached with a vengeance. The hills cater to the tourist and other trades with hotels, motels and guest houses competing for the fast disappearing view, forest cover and animals. The most venerated shrine of Buddhists the world over, the Sri Dalada Maligawa, the Asgiriya and Malwatte temples, the beautiful lake and all the Mosques, Churches, Kovils, archaeological sites and the two rain forests within the District will face the consequences of “progress”. There have been earth-slips, alternating flooding, droughts and hot temperatures in the recent past. Kandy may face a similar fate as Aranayake did in May 2016. A landslide of the unstable hills can wipe out the glorious past we boast about. Are the authorities worried? Environment apparently is not a priority. Plans are afoot to; i) enlarge the Goods Shed bus stand and build it up to three storeys, ii) build roads on the end of the lake where footpaths currently allow pedestrian traffic, iii) fill the Nuwara Wela paddy / marshy land for a pilgrim bus stand catering to the Maligawa visitors and iv) build the country’s longest tunnel for “traffic diversion”. In addition to building allowed on the hillsides regardless of the degree of the slope or elevation, schools are being expanded for more students, roads are widened to allow more traffic and many public areas encroached without consequence. With more residents falling ill, needing excess travel time to get anywhere etc. the subsequent loss of productivity and thereby the cost incurred is on a steady rise. More trees are cut to make way for progress and the vicious cycle continues regardless of the negative consequences. Before a catastrophe of the magnitude of Aranayake takes place in Kandy, we need to start decongesting the city in order for sustainable development.Develop the peripheries of Kandy and encourage a transition from the city for more customer friendly interaction. Thereafter, the improving phase of SUSTAINABLE development within the city can begin by removing illegal constructions and strictly maintaining the law. The development of the city of Kandy can be an example in Sri Lanka towards making a Carbon Neutral City by encouraging reforesting, minimizing waste, harnessing and utilizing sustainable energy etc. Electric cars, especially of a certain make, are not an uncommon sight on our roads these days. Internationally, the current trend is that the market for electric vehicles (or EVs for short) is growing. Many auto industry analysts predict that electric is the future. Electric vehicles have a number of advantages over conventional petroleum-powered vehicles. First, because of their zero direct emissions, air quality in urban areas improves with its obvious health benefits. They produce no CO2 emissions, the chief greenhouse gas. However, there are still emissions associated with the electricity used to charge an EV if it is from the grid unless noncarbon sources of energy are used to generate the electricity. Nevertheless, the net emission levels associated with electric cars are arguably still lower because of the greater efficiency of thermal power plants over the individual internal combustion engines of conventional vehicles (though coal-generated power complicates the picture) and, in the Sri Lankan context, hydroelectric power, a clean form of energy, still plays a significant role in the power generation mix. Other benefits include lower maintenance costs, less noise pollution because EVs are quieter. Motivated by environmental concerns, I bought my first electric vehicle in 2015 and soon afterwards saw with dismay that, although the previous government had encouraged the use of electric vehicles in the form of a concessionary duty rate, the newly elected government, by playing fast and loose with duty rates, had wreaked havoc in the nascent local EV industry. The casualties include the car dealer from whom I purchased my first electric car. His company, which specialised in electric vehicles, crashed, leaving both him and his customers in the lurch. The number of registrations of electric motor cars in 2015 was 3238. Due to the increase in the duty rate this figure plummeted to 983 in 2016 and up to July in 2017 only 161 cars had been registered (source: Public Utilities Commission of Sri Lanka). These facts are depressing when considering the worldwide trend for governments to promote electric vehicles in recognition of their environmental friendly nature by offering various incentives, with some countries even planning to ban the sale of diesel and electric vehicles by certain future dates. Our closest neighbour India has set itself an ambitious target to go all-electric by 2030. The total number of electric motor cars registered in Sri Lanka at present is about 4,500. In addition to motor cars, there is also a number of other electric vehicles, including motor cycles. The ratio of electric vehicles to conventional vehicles will not increase unless the government actively encourages their adoption by offering various incentives, since most potential EV buyers will be motivated by cost savings rather than environmental concerns. As things stand today, overall savings-wise, there is not much to commend electric vehicles in this country except that the installation of a solar system by the user will bring down running costs significantly because of a supply of cheap electricity. The Government has announced that the forthcoming budget will be a green one and it is hoped that the budget proposals envisage a reduction in duty rates not only to make EVs more competitive than conventional vehicles but also to make the cost of battery replacements, which is still prohibitively expensive today, more affordable. As the stock of EVs on our roads increases, concessions can be linked to the installation of a solar system by the EV user as the maximum environmental benefits of EVs can be obtained only by charging them using electricity generated by noncarbon sources of energy or, at least, by reducing the EV user’s carbon foot print by installing such a system. “Range anxiety” is an expression familiar to EV users. This means the worry on the part of a person driving an electric car that its battery will run out of power before the destination or a suitable charging point is reached. Range anxiety is the most important reason why many are reluctant to buy electric cars. This anxiety, which is somewhat overblown since most motorists for most of the time drive within a limited radius but is nevetheless applicable to long trips, can be allayed only by installing a sufficient number of high-speed EV chargers, at least of the level 2 type, to cover all parts of the country. Here is another area where the state can step in to help the cause of electric vehicles by subsidising the installation of more public chargers and even developing this infrastructure at its own expense. Still on the subject of EV charging, the availability of a time of use tariff to domestic consumers of electricity will enable EV charging at off peak times to exploit the reduced rates and further incentivize the purchase of electric vehicles. Electric vehicles are equipped with a facility to programme charging times. Concessionary tariffs for public charging stations, too, could be introduced but not so concessionary as to make this form of charging cheaper than charging at home. In passing, it may be mentioned that some of the incentives governments in certain developed countries offer to promote the adoption of electric vehicles include exemption from taxes and road tolls, lower registration fee, free parking and charging, subsidies to install charging stations, the freedom to use bus lanes(!). Unplanned teacher transfers which have come into effect this month have left the Advanced Level students sitting the exam next August (2018) stranded. In some schools the teachers teaching in the English medium students have been replaced by those who can teach only in the Sinhala medium, thus leaving the poor students helpless. We hope the Minister of Education will look into this matter as soon as possible and take immediate action to rectify the error. After reading about how the Rohingya refugees were treated at the Mount Lavinia refugee centre by some thugs calling themselves Buddhists I would like to pen a few words about how we have been treated in our neighbourhood by our Buddhist brethren.We are the only Muslim family living in this lane for more than 20 years. One of our siblings fell ill with cancer and spent a few traumatic years in and out of hospitals. During this period which was the most difficult time in our lives, the overwhelming support and help we received from our Sinhalese neighbours cannot be described in words. Their eagerness to help us during our hour of need is something we will never be able to forget during our lifetime. Everyday during her stay at home taking treatment somebody from the neighbourhood made it a point to bring her meals. Sometimes all three meals were provided and they made it a point to bring her whatever special snacks they made or fruits from their mango, lovi and narang trees because she liked to eat sour things. They provided transport to hospitals and even carried her in their arms when she was unable to walk. They brought thambili by the wheeler loads and were always there when we needed them. May Almight Allah and the Triple Gem bless you all. Some of us who drive over the Polduwa bridge and get caught up with the traffic snarl up to Rajagiriya (at all times of the day and night) have realised that the flyover being constructed at Rajagiriya will not really help ease the congestion. This is because the real cause of the traffic snarl as you leave the bridge are: the two roads on the left leading into and out of Etul-Kotte, then Cooray Mawatha again on your left which is a short cut to the Nawala Road, and the road on your right by the side of HSBC. Motorists (from both directions) have to give way to traffic coming out and going into these four roads. Here lies the jam. The flyover only facilitates a ride over the Rajagiriya junction but to get to this is a bumper to bumper struggle. Also motorists getting out of Rajagiriya from Colombo via this flyover will meet with the same challenges as they need to drive nose to tail past these four by-roads. I am no town planner, engineer or architect. But I do wish there was a way to facilitate a flyover starting from the Polduwa bridge down and over the Rajagiriya junction. What bliss this will be!